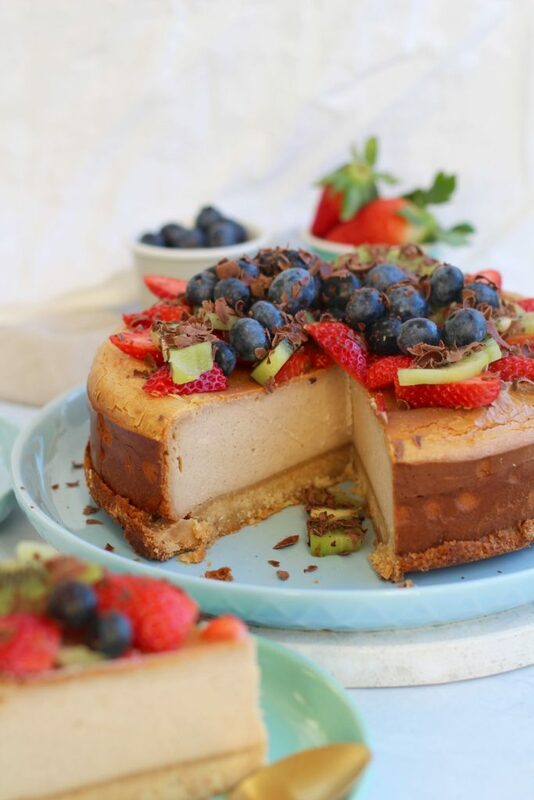 Peanut butter cheesecake | No refined sugar, no grains, no gluten! Far out this peanut butter cheesecake is all kinds of amazing. 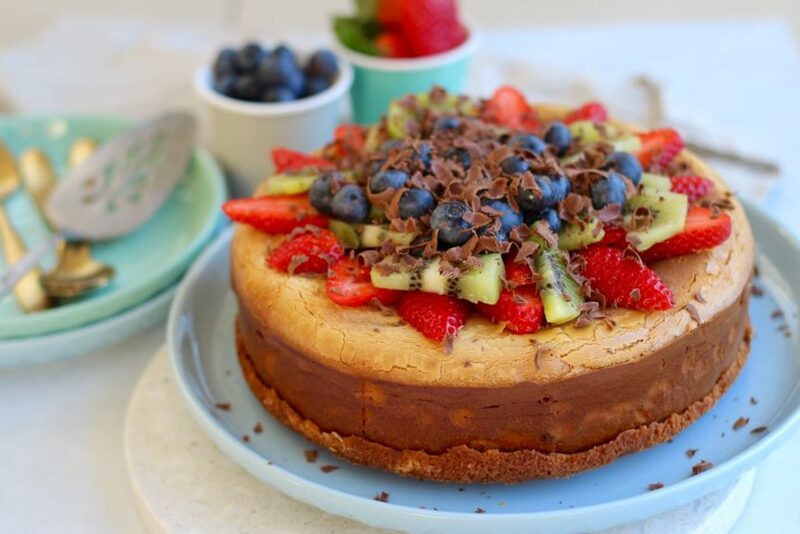 It’s gluten free, sugar free, grain free but it’s got a whole heap of dairy because this healthy cheesecake is actually a real life cheesecake. 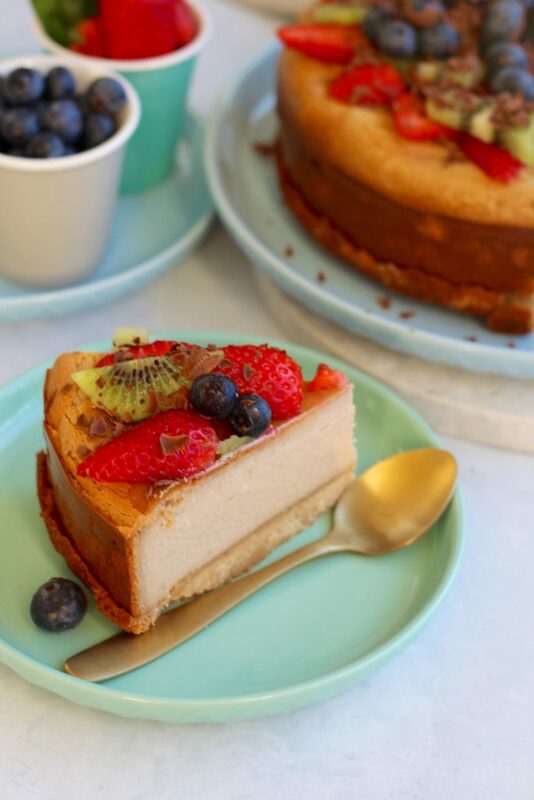 So if you’re a fan of peanut butter and a fan of baked cheesecakes, this is the recipe for you! Plus it’s actually an easy cake to make. We made this cake (actually, Carla made it) for Mum’s Birthday and she loved it. We all did! And we all went to healthy peanut butter cheesecake town. Even though Carla is dairy free and I (Emma) don’t usually choose to eat dairy… every now and then we will. We find that being less restrictive has helped us create much healthier and happier relationships with food, our diets and our health in general. And, we enjoyed every single bite of this peanut butter cheesecake and didn’t waste any time feeling guilty about it. We wrote more about our experience with orthorexia and the way we eat now over here. Ahhh and of course we decorated the cake. We topped it with fresh strawberries, blueberries and kiwi. Oh, and shaved chocolate. Seriously, Carla #cancheesecake. This extra special recipe is an app only recipe. And we will be sharing more and more app only recipes yay yay yay! The app is only $4.49 (AUS) and you get over 250 unlocked recipes, including the best recipes from the blog and exclusive app only recipes PLUS you get the opportunity to unlock special app bundles. Read more about the app and download it here. Or simply search ‘Get Merry’ in your app store. P.s here’s another photo of the cake. Droooool!